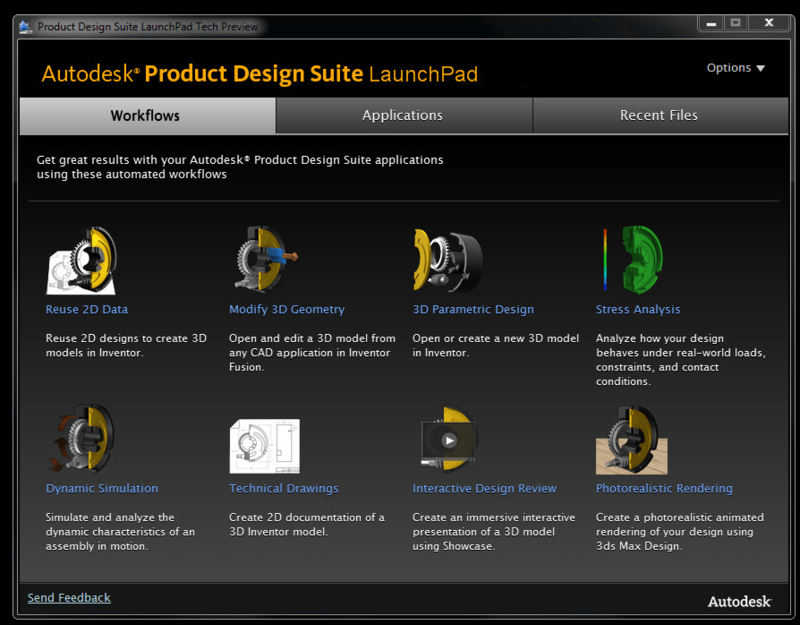 Autodesk Labs presents LaunchPad. The LaunchPad Technology Preview accelerates design efforts by providing a single portal into Product Design Suite applications, project data, and workflows. The LaunchPad’s one-click workflows prepare your design data in the Suite environment that is most appropriate to your task so you can quickly start designing, engineering, simulating, and visualizing your design. The LaunchPad is intended for users who already have Product Design Suite installed. Your AutoCAD based product crashes when you try to orbit the model using the shift + Center mouse button. Use the orbit command in the navigation tools instead of shift + center mouse button to orbit the model. Start the orbit command, right click and in the right click menu uncheck the item “Enable Orbit Auto Target”. Use the transparent orbit as normal. The world of computing is always changing: corporate mainframe computers were replaced by desktops; desktops became laptops; phones became mobile and then became smart; mobile data streaming allowed smartphone, handheld and tablet device users to be connected anywhere in the world. These advances were ‘game changers’ – new technology that made older systems obsolete almost overnight. They were revolutions not evolutions, and those businesses that couldn’t adapt quickly enough were replaced by those that could. A revolutionary change is happening now - the move to cloud computing (or Software as a Service (SaaS)). Cloud computing is essentially just renting processing power and storage space on a virtual server that is managed in a remote datacenter and which you access over the internet. The technology is now mature – it is reliable, low cost, and simple to use. Vendors such as Amazon, Microsoft and Google are competing with each other to make their cloud services more reliable, cheaper, and easier to use than their competitors. Autodesk is experimenting extensively with cloud services. See labs.autodesk.com for some of our technology previews, or visit www.autodesk.com to discover some of our mature solutions, such as Autodesk Homestyler® or Green Building Studio®, that are available now. Your application performs a processor intensive task, such as photo-realistic rendering, FEA analysis, or feature recognition. Instead of tying up your customer's computer for hours, why not send the raw data to a virtual machine on the cloud and then send the results back when they are finished. While your cloud service is grinding away at the data, your customer can carry on with their work. Your application, or the reference data it uses, frequently changes. Instead of shipping frequent updates for your customer to install, you can just update one application on your cloud server and your updated algorithm or data is immediately available to all your customers. Your customers are accessing a common dataset from geographically distributed locations. That data needs to be stored somewhere, so do you buy a set of servers, rent a room to house them in, and pay a server admin to maintain them; or do you just rent space in the cloud and let your cloud provider take care of all the maintenance and administration for you? Demand for your services varies significantly through the day. Perhaps you have thousands of customers accessing your services during peak hours, but only one or two during the night. Should you scale your server farm to cope with the peak demand and accept that most of the time your processors will be idle, should you plan for the average demand and accept that customers will be frustrated during peak demand; or should you use a cloud provider that can automatically bring additional servers online for you at the peak and remove them when they’re no longer needed – and you only pay for the additional servers when you’re using them? Startup costs for cloud computing are so low that you can easily afford to experiment with the technology. And the learning curve is shallow, so it's an easy step from writing desktop applications to cloud applications. Up in the Cloud — An overview of the benefits of cloud computing by Jim Quanci, Director for the Autodesk Developer Network. Getting Started with Cloud Computing — An introduction to the basics of creating a cloud computing application with demonstrations of integrating a cloud service with an AutoCAD® plug-in application by Stephen Preston, Autodesk Developer Network. Cloud Computing Revit Demo — A demonstration of integrating a cloud service with an Autodesk® Revit® plug-in application by Jeremy Tammik, Autodesk Developer Network. Cloud Computing Inventor Demo — A demonstration of integrating a cloud service with an Autodesk® Inventor® plug-in application by Philippe Leefsma, Autodesk Developer Network. Cloud Computing Civil 3D Demo — A demonstration of integrating a cloud service with an Autodesk® Civil 3D® plug-in application by Augusto Gonçalves, Autodesk Developer Network. The sample code used in the demonstration is available here. General Licensing: Do I need IPv6 Network License Manager for Windows? What is an Autodesk ID? How do I create an Autodesk ID? How do I change my password or e-mail address? What are the minimum character requirements for my Autodesk ID account? How can I get additional help if I can’t resolve my sign-in issues?